On August 14th and 15th leases for most downtown area apartments end. That means that thousands of residents will be moving out of their old apartments and into new ones. In 2017, Madison's student moving days put over 1 million pounds of material into the landfill. That's so much stuff. It is crucial to follow the rules and regulations so Streets Division crews can collect all that waste material as quickly and safely as possible. Also, 1 million pounds into the landfill !?! We can do better than that. Before you landfill it, donate it, or sell it, or best yet, move it with you. See below for the resources to help reduce the amount of your stuff going to the landfill during these moving days. After you have gathered all you you need for your new apartment, let's find the stuff you don't need a new home instead of adding it to the landfill. Usable items like clean clothing, functional household items, small furniture, unopened nonperishable food, and kitchen items are all very easily donated. There are many, many thrift stores in the Madison area that accept items. A list of several of them are later on this website. Goodwill donation stations have been set up at the following apartment buildings during move out times. The use of these apartment building donation stations are limited to residents of the respective buildings. For dates and other information, residents of these buildings should check with their property manager. If you do not live in one of the apartments listed above, and still have useable goods you would like to donate, and also maybe help out a good cause in the process, use these resources listed below. Be sure to contact the organization you would like to donate these items to before showing up just to be sure they accept the material you would like to donate. For 2018, the Streets Division will empty refuse and recycling carts in the downtown moving area everyday between August 6 through August 15th. 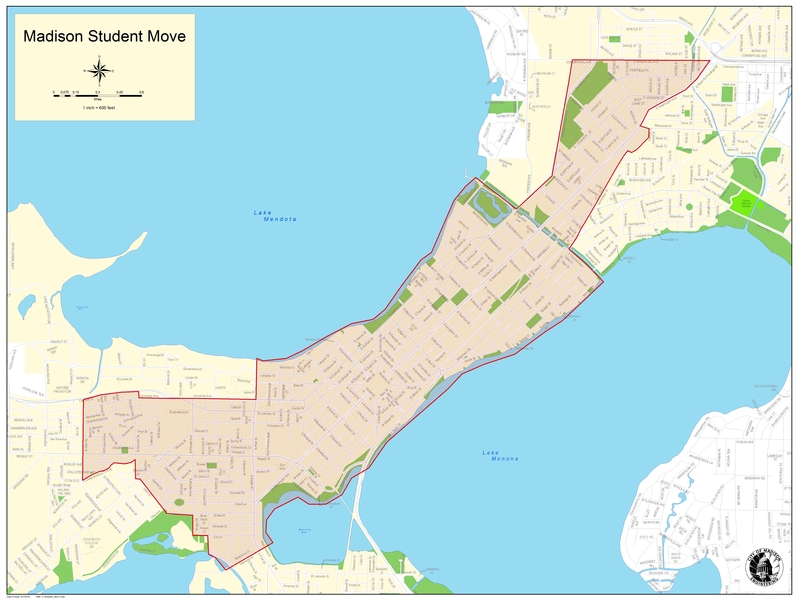 The student move areas will be monitored daily starting July 30, and crews will be assigned to collect from the student move areas as needed. Fill up your carts with the appropriate material according to the guidelines below and roll them to the curb during that window. We will empty your carts so you can fill them up again. And we'll empty them again the next day. You may fill up your refuse and recycling carts and roll them out daily from August 6 to August 15. 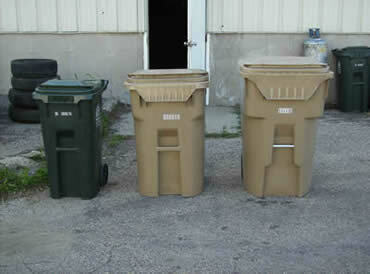 Using your carts for refuse and recycling is easier than hauling bags or piling loose material to the curb. Plus, it keeps your neighborhood clean, and makes our collection much faster so we can stay out of your way while you move. Do NOT put trash in cardboard boxes. Boxes are recyclable. Stuffing them with trash means they get sent to the landfill. Please flatten and bundle them for recycling. Put all recycling at the curb in the green recycling cart or, if necessary, in clear plastic bags outside your filled cart. No loose piles of recycling, or stuffed into other containers. LEAVE YOUR APARTMENT'S CARTS THERE. Do not take them with you. The carts belong to the City and must remain behind when you move for the new tenants. There will be carts at your new apartment if that building uses City solid waste services. Most appliances, including microwaves, require a fee for collection. You will need to purchase a fee sticker prior to placing that item out for collection. Do not place televisions at the curb. They must be brought to a drop off site for recycling. There is a recycling fee for each television. Do not place computers or laptops at the curb. They must be brought to a drop off site for recycling. There is a recycling fee for each computer or laptop. (608)266-4681 if you live west of S. Park (and that includes the area around Camp Randall). And you can email us. In 2018, individuals that own non-owner occupied property in the student move area will have received a copy of this letter providing notification about how the Streets Division will handle certain items set to the curb that should not be. Be sure your tenants know their responsibilities on how to safely handle these items. Provide them with the Recyclopedia. You can also elect share with them the fact sheets we have for recycling, refuse, large item collection, and cart use. Also, if items are dumped illegally on your property, it is a crime and should be reported to the Madison Police Department. After obtaining the case number from MPD, contact the Streets Division to learn the next steps. Sell or Give Away Usable Items or Find Bargains for Your New Apartment on the Madison Stuff Exchange.